Apple recently released their new iPad computer. While much of the media coverage has focused on the technological innovations and limitations of the device, AirSafeNews.com has a different focus - how this type of computer will affect the average air traveler. After a couple of days of testing and evaluation, AirSafeNews.com's Todd Curtis has a few thoughts about this machine, and some of the issues this device may raise for air travelers. For years, airline passengers have been required to take out laptops and other large electronic devices out of their carry on baggage for separate screening at checkpoints. The classic laptop computer opens up like a clam shell to reveal a keyboard and a screen. Given the design of the iPad (it has no keyboard) and it's relatively small size and light weight (much smaller and lighter than the average Oprah magazine), it does not make sense to treat this device as one would a laptop computer. In other words, there is no real need to take it out for separate screening. One could certainly make the argument that it is possible that someone bent on destroying an aircraft could pack an iPad with explosives, making it necessary to separately screen the device. However, the counter argument is that there are many other items (including the aforementioned Oprah) that have much more room to work with than an iPad, and that don't have to be taken out of your carry on bag. Unless there is some other compelling circumstance, for example, a passenger selected for special screening, there is no reason for TSA to worry about an exploding iPad. You should also take steps to protect your iPad from loss, theft, or damage. First, don't put it in checked baggage. The risk of damage from rough handling and theft is always high for expensive and fragile items like electronics. Also, if you are asked to check your carry on at the last minute, be sure to take out your iPad and other small and valuable items from your carry on and place them in a smaller bag that can fit under your seat. While iPads have many functions that work without having access to the Internet, most of the really interesting functions require that you be online. Fortunately, airports around the US are embracing the use of free wi-fi in the terminals, making it easy to get online before you get on the plane. Only a handful of airlines offer any kind of in flight Internet access, so make sure you have your music, books, and videos loaded into your iPad before you take off. While the iPad is not very convenient for doing typical business related functions like creating or editing documents, it is an excellent device for web surfing and video playing in small spaces like the typical seat back tray in coach. Given an estimated battery life of 10 hours, a passenger can provide entertainment during a transatlantic or transpacific flight. Because of its ability to play very high resolution videos, it will be a great platform for playing movies, with better performance that most laptops when it comes to brightness and clarity. The potential problem with that will be the choice of material and whether it is appropriate for an airline cabin. 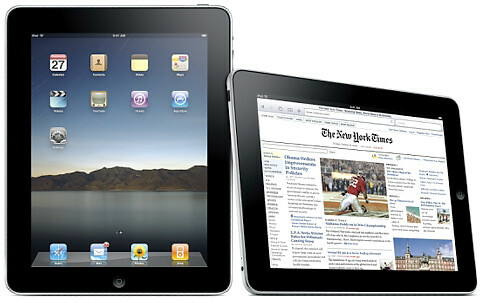 The iPad can also function as a giant iPod, and can play videos or movies stored in its memory. As AirSafe.com pointed out in an article about the appropriate use of personal electronic devices, there few airline policies that deal with what a passenger can or can't do with their personal entertainment devices. One common sense thing you should do is use headphones so that you don't disturb other passengers. While there may not be any laws restricting what you can play on your iPad, any passenger with an iPad should use their common sense when it comes to videos and movies, especially when it comes to material that may be upsetting to your seatmate. For example, I'll have a personal rule of avoid playing in flight any of the plane crash related videos produced by AirSafe.com. To get an idea of what you won't be seeing on my iPad while I'm flying, check out the AirSafe.com video channel at YouTube. I've traveled on the airlines with a wide range of portable electronic devices, including tablet PCs and touchscreens comparable in size and shape to the iPad. Over the past eight or nine years, the TSA has very consistently required be to remove anything larger than a Blackberry and run it through screening. Based on this experience, I suspect that we'll have to run our iPads through seperately, while our iPods remain in our carry-ons. I've been told that the reason for a separate screening of a lap top, is the screen. It blocks the capability of the scanner to see what´s below. I guess with Ipad, or any other handheld device with a big screen, the same will apply.